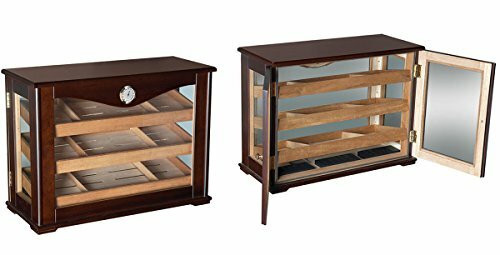 This generous 250 cigar capacity countertop display features 3 large removable and reversible angled cedar trays with 2 dividers in each. With the retail environment in mind, this display is constructed with four glass sides for easy viewing from virtually any angle. The Marciano is the ideal humidor display case for retail countertop use or for the smoker that wants to show off their cigar collection. Each Marciano display humidor comes with a lock & key set for added security to protect its contents. This large unit comes with 2 oblong humidifiers and a gold framed glass face external hygrometer. Humidity levels can easily be monitored from the outside of the case to insure your smokes are always kept in the right environment.